Algerian food is characterized by the interplay of European and Arab influences. The shakhshūkha, barrāniyya, couscous, and skewered foods are inherited from the Arabs, Berbers, and Turks, whereas the soups, mixed salads, and some desserts are European influenced. The group of dishes known as shakhshūkha are vegetables cooked with lots of eggs stirred into them. They derive from a Turkish dish made with bell peppers, onions, and eggs called şakşuka. One will often hear that this is an Israeli dish. It is not. It is Algerian, but it�s true that Algerian Jews in Israel brought the dish with them when they immigrated. The category of dishes known as barrāniyya is breaded or floured vegetables or meat that are fried with oil and cooked in a sauce. The word barrāniyya comes from the Arabic root word meaning �to surround.� Another group of dishes are cooked in the style of shaṭīṭḥa, a word that means �that which dances,� implying that the sauce is so piquant it makes the food jump in your mouth or that it jumps in the skillet, since it is cooked like a fricassée. The two main cooking methods in Algerian cuisine are simmering and braising, although the others, such as boiling and grilling are, of course, used also. Two kinds of sauces are used, maraqat ḥamrā, red sauce, and maraqat bayḍāc, white sauce. Sauces are not usually made separate from the meal, as they are in French cuisine. Some sauces use aghda, an emulsifier or binding agent made from finely chopped egg whites and other ingredients. The Algerian white sauces are not the same as classic French sauces for they do not contain milk. They can be differentiated into three kinds. First, the white sauce that is called �white sauce,� maraqat baydāc, that is made with a base of butter or oil and seasoned with onion, black pepper, cinnamon, ginger, saffron, or turmeric, is used with couscous or meat cooked with vegetables. The maraqat ḥalwā, or sweet sauce, is also made from butter and seasoned with cinnamon, saffron, and honey or sugar and is used for sweet dishes. The third white sauce, muḥammar, or roasting sauce (although it�s derived from the Arabic word for red), is a butter- or samna-based sauce (clarified butter) seasoned with onion, cinnamon sticks, and saffron and is used for roasting or spit-roasting meats. Among the red sauces is maraqat ḥamra, red sauce, with a base of red bell peppers seasoned with black pepper, salt, and cinnamon, which is used for meat, offal, couscous, and vegetables. 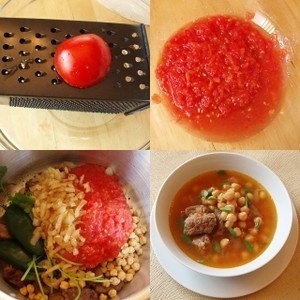 Maraqa bi�l-ṭūmāṭīsh is Algerian-style tomato sauce with a base of tomatoes, onions, and garlic seasoned with black pepper and cumin. It is typically used with fish, meat, and on pasta, rice, fried fish, and French fried potatoes. Shaṭīṭḥa (that which dances), is also a word that means red pepper; it is a hot chile sauce seasoned with garlic, caraway, and cumin, and is used for fish and meat. The fourth of the red sauces is the musharmala, which is also a highly seasonedsauce for fish or meat, but more so, and contains vinegar or lemon juice. In each of these sauces the cook seasons in accordance with his or her own taste using a variety of other herbs or spices. In eastern Algeria, one finds hot red chile sauces and sweets made with honey or dates. In the central part of Algeria, white sauces and breaded or floured fried meats are found along with desserts made with almonds, such as maqrūd, lozenge-shaped pieces of semolina and almonds. In the west, velouté sauces that are slightly sweet predominate. The two great culinary centers of Algeria are Constantine and Tlemcen, which was influenced by Muslim-Andalusi. Other major culinary centers are Algiers, Beja�a, Sétif, and Oran. A favorite Algerian spice is cayenne pepper, a New World spice, while other common spices in Algerian cuisine are black pepper, cumin, ginger, fennel, caraway, aniseed, wild parsley, mint, cinnamon, and cloves. Many dishes involve long simmering. The culinary complexity of Algeria is like that of Italy, but because of its remoteness for many Westerners, not to mention the terroristic civil war that erupted in the early 1990s and targeted foreigners, very little is known about Algerian cuisine. There are fascinating preparations that I have only heard about--for example, the Algerian dish of cumin- and saffron-rubbed whole lamb shoulder wrapped in cheesecloth and placed in the upper portion of a couscoussi�re where it is steamed for a day. An Algerian acquaintance of mine, Nacim Zeghlache described a dish from Sétif of semolina balls stuffed with minced onions and cooked in a sauce of onions and tomatoes, but a man who lived in a village thirteen miles away had never seen or heard of it and asked if the semolina balls grew on trees. Also near Sétif, in the high plains where wheat is grown, farmers store their hard wheat in silos. After a while the wheat adhering to the walls begins to ferment and the farmers� wives scrape it off and cook it. They call this silo-scraped fermented wheat mashruwwbāt, the plural of the word for alcoholic refreshment, and its odor is curiously similar to that of Gruy�re cheese, which may be not too far-fetched an explanation for the popularity of that Swiss cheese in Algiers. As far as cheese goes, the people of the Maghrib do not have a large repertoire of cheeses, although they do have high-quality white cheeses such as a soft Algerian cheese with an artichoke heart in the middle. Couscous is a staple food in Algeria. Masfūf is an Algerian-style couscous that is steamed over broth. Little bits of carrots and peas are sautéed separately in butter and turn into the steamed couscous. Algerians are also fond of couscous with curdled milk. A larger couscous grain is known as burkūkis, what the Tunisians call muḥammaṣ, basically a pasta ball-looking couscous. Algerian seafood cookery is found along the coast. The catch is small, but the little that is caught is excellently prepared, the most common fish being the gilt-head bream. Sardines and grouper are also popular.